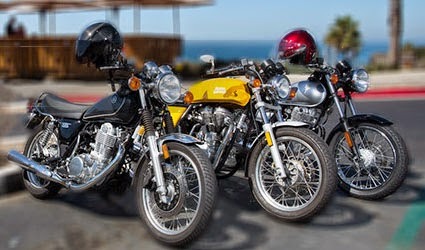 MotorcycleUSA.com compared the Royal Enfield Continental GT to Japanese competitors. It's a thorough test, complete with individual videos of the three motorcycles and charts showing torque and horsepower curves. The Continental GT was rated high on looks, character and handling and nicked for fit-and-finish issues, an imperfect transmission and an occasional stall. It also carried the highest price of the three. Thorough as it is, the article won't change anyone's mind. You won't be surprised to learn that Yamaha and Suzuki offered Japanese quality, better fuel economy and lower prices. In fact, the two Japanese motorcycles were so consistent they tied for first place. "Affordable urban transportation" is the phrase used for the Suzuki. Be still, my heart. For me — and likely for you if you are reading my blog — the Royal Enfield emerged the clear winner. Do just one thing: start the video that covers the Royal Enfield Continental GT. Watch and listen just until the Continental GT runs. Hear THAT? The sound tells you everything you need to know. Go on to watch the videos for the Yamaha and Suzuki if you want. They sound exactly as you know they will, because if you've lived in the United States you've listened to thousands of Japanese motorcycles going by. They sound OK. Their motors are running, always a good thing. The Royal Enfield Continental GT sounds tremendous. they sent kids to evaluate the bikes,who seem to know nothing of motorcycles. [ this one looks pretty] the gt has a racing frame, thats why it dose not turn sharp in city traffic. these kids need to stick to something they know, like power rangers. Yes, it IS a lovely bike. For God's sake put the updated Series 3 twin in it! The torque curve says it all. More torque at lower revs. That's what I want in the city…or anywhere.